To date, rifle makers chambering the 6.5 PRC include GA Precision, Gunwerks, Horizon Firearms, PROOF Research, Stuteville Precision and Seekins Precision. No doubt this list will grow longer in 2018. Presumably, in the future, Hornady will offer 6.5 PRC brass separately for hand-loaders, but Hornady has no time-line for brass availability. Bumping the velocity of the very popular and already highly-capable 6.5 Creedmoor by up to 10%, Hornady’s new 6.5 PRC (Precision Rifle Cartridge) is sure to be a hit. Dubbed the “big brother” to the 6.5 Creedmoor, the 6.5 PRC fits in short or medium actions with a standard magnum bolt face (.532”). The case geometry features a long cartridge case neck and 30-degree case shoulder. It sort of looks like a 6.5 Creedmoor on steroids. 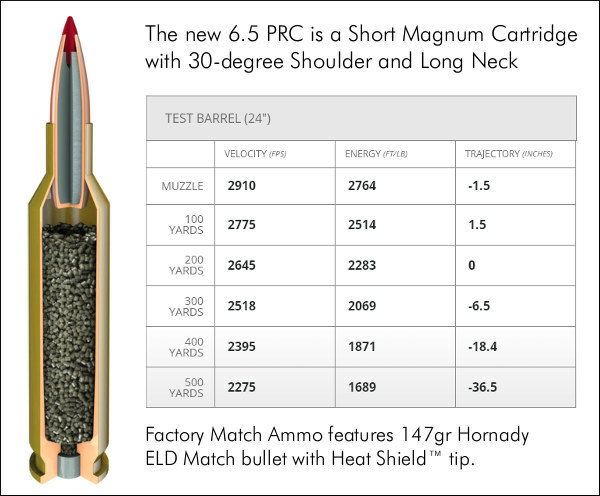 For its loaded 6.5 PRC Match Ammo, Hornady is showing a 2910 fps Muzzle Velocity with the 147gr ELD Match bullet.